When it Comes to 20V Max Vs 18V Batteries, Which is More Powerful? The 18V vs 20V Max debate will continue to go on no matter how many times I step into someone else’s conversation and explain it to them. Let me take the drama out of the conversation now – they’re the same. Seriously though, I love talking about this stuff, so let’s jump on it. Here in the U.S., manufacturers such as Bosch, Milwaukee, Ridgid, Ryobi, and Makita are all running on an 18V battery platform. DeWalt and Porter-Cable run on their 20V Max systems. A volt meter is all that it takes to offer some quantifiable data, and a look inside the battery will show you why. Inside your battery pack are the individual battery cells. In an 18V/20V Max system, they are always set in groups of 5 wired in a series. Each group of 5 is then wired in parallel to increase the number of amp hours and overall battery capacity in watt hours. For more on that, check out our feature on Voltage Vs. Amp Hours. Each one of those battery cells has two voltage ratings – nominal and maximum. The amount of voltage that a battery produces when fully charged is higher than when it begins to discharge, even slightly. It’s actually a chemical characteristic of the lithium-ion system. Each battery cell has a nominal voltage of 3.6 volts and a maximum voltage of just over 4 volts. That’s it. That’s the entire difference in 18V vs 20V Max batteries. It’s only a matter of whether the company is using nominal voltage or maximum voltage as their rating. 20V Max Vs 18V: What About Higher and Lower Voltage Systems? This brings up several interesting talking points. First, many European countries are more strict on how a company can advertise. You’ll find that tools are sold by their nominal voltage in most areas. That means 18V high power tools and 10.8 volt lower power tools. From a marketing standpoint, being able to put a higher number on the tool makes it seem more powerful. Putting a nominal voltage on it is a representation of where the battery operated most of the time. For some reason, 20V Max vs 18V debate only seems to be an issue among these 5 cell group platforms. Everyone advertises their 12V line (3 cells), not their 10.8V families. Jump up to OPE (Outdoor Power Equipment) and we get 40V systems (10 cells) that are taking the place of the 36V platforms of a couple of years ago. So before you leave with a bad taste in your mouth about DeWalt or Porter-Cable, understand that everyone does it somewhere. Speaking of DeWalt and Porter-Cable, you’ll notice on their packaging that it is marked 20V Max*. That asterisk and the word “Max” points to the documentation that clearly states the voltage is maximum. Is it a marketing tactic? Yes. Is it misleading? Only if you don’t look for an explanation when you see something marked with an asterisk. So yes, 18V and 20V Max systems have the same amount of voltage power. However, the guts of each battery cell do vary from brand to brand and even within a single brand as technology and chemistry improve. So is DeWalt’s 20V Max line more powerful than their 18V line was? Yes. Because the electronics, motors, and cells are better, but they’re putting out the exact same voltage! Do you use Google+? 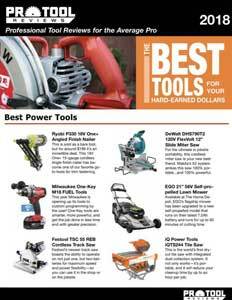 Follow Pro Tool Reviews! When will 2170 cells play a role here? These guys are killing me. STOP STOP STOP changes the batteries. I have 18 volt DeWalt and don’t want more chargers. To all tool companies. I will commit to your tools if you promise to never change the battery pack/charger ever again. Post a 100 million dollar bond to prove it. Change the system and lose the money and go to jail. I am about to dump DeWalt over this issue. Who want’s my business? On another interesting note, with many lithium ion battery packs, if you were to take off the shell, you’d see arrays of 18650 batteries, which are used in the majority of vaping devices.. Whoah, I’m chasing clouds dood with my 20v max..